SpaceWatchtower: Iconic Radio Telescope to be Moth-Balled? Iconic Radio Telescope to be Moth-Balled? Astronomy Observatory at Green Bank, West Virginia in July of 1974. A very large and iconic radio telescope in West Virginia could be shuttered, with the possible loss of National Science Foundation (NSF) funding in the near future. The U.S. Government agency, which funds fundamental research and education in all non-medical fields of science and engineering, wishes to free-up money for newer projects and facilities. One of the major facilities being considered for defunding is the Robert C. Byrd Green Bank Telescope of the National Radio Astronomy Observatory in Green Bank, West Virginia. Several other radio, solar, optical, and near-infrared telescopes in several locations such as Arizona, New Mexico, and Chile, including the huge radio telescope dish in Arecibo, Puerto Rico, are also being considered for divestment by the agency. On October 19, the National Science Foundation announced that it would consider several alternatives regarding the future of the Robert C. Byrd Green Bank Telescope, as part of a Federal Environmental Impact Statement process. These alternatives range from continuing NSF funding to possibly moth-balling the telescope, or even possibly deconstructing the telescope. NSF developed the Robert C. Byrd Green Bank Telescope and owns the land where it sits. Last year, NSF sought public comment from scientists and the West Virginia community regarding the telescope's future. Thus far, no decision has been made. The National Radio Astronomy Observatory (NRAO), with its largest facilities located in the small village of Green Bank in Pocahontas County, West Virginia, includes the world's largest fully-steerable radio telescope, the 328-foot / 100-meter Robert C. Byrd Green Bank Telescope. NRAO is also the home to several other radio telescopes, including a 140-foot / 43-meter telescope with an equatorial mount uncommon for most radio telescopes, three 85-foot / 26-meter telescopes forming the Green Bank Interferometer, a 40-foot / 12-meter telescope used for small-scale research by school students and educational organizations, and a fixed radio “horn” built to observe the Cassiopeia A radio source. At Green Bank there also is a reproduction of the original antenna, used by Karl Jansky at Bell Labs, which first detected radio interference that was determined to be radio waves from the early Universe, shortly after the Big Bang. The 328-foot / 100-meter Robert C. Byrd Green Bank Telescope, the world's largest fully-steerable radio telescope completed in 2001. The Robert C. Byrd Green Bank Telescope, which was built in 2001, is also one of the newest such telescopes. Its construction was necessitated by the collapse of a 296.7-foot / 90.44-meter radio telescope, built in 1962, on 1988 November 15. Several discoveries have been made by the Robert C. Byrd Green Bank Telescope, in its short life, including the detection of three new millisecond pulsars in the globular cluster M-62 (2002), discovery of a large coil-shaped magnetic field in the Orion Molecular Cloud of the Orion Constellation (2006), and discovery of a large hydrogen-gas superbubble 23,000 light years away called the Ophiuchus Superbubble (2006). More recently, the telescope has discovered the most massive neutron star to-date and primordial and molecular clouds surrounding several galaxies. The telescope is also being used to scan the “quiet zone” radio spectrum of 1 to 10 GHz as part of the “Breakthrough Listen” project, which may someday detect radio signals from extraterrestrial civilizations. The National Radio Astronomy Observatory is located within the National Radio Quiet Zone, an area where radio transmissions are severely restricted to aid scientific research and military intelligence. This 13,000 square-mile / 34,000 square-kilometer Zone includes a large part of eastern West Virginia, a smaller part of western Virginia, and a tiny part of Maryland. With a population of approximately 179, Green Bank, West Virginia is near the center of the National Radio Quiet Zone and is, by Federal law, a town without cellular telephones, wireless Internet routers, or any other types of radio transmitters. What became a major controversy began when, in August of 2012, a National Science Foundation Astronomy Portfolio Review Committee chaired by Daniel Eisenstein of Harvard University recommended that the Robert C. Byrd Green Bank Telescope be defunded over a five-year period. The U.S. Congress did not choose to defund the NRAO in the Fiscal Year 2014 budget. So, NSF continued funding the Robert C. Byrd Green Bank Telescope, but at a lower level. While they funded 95 per-cent of the telescope's $10 million operating cost in 2012, the funding for the Fiscal Year 2017 has been reduced to 66 per-cent. While the NSF wants to use their very limited resources to fund newer projects and telescopes, astronomers argue that the Robert C. Byrd Green Bank Telescope is still a state-of-the-art facility, which has unique capabilities other telescopes cannot match. As the world's largest steerable radio telescope, the Robert C. Byrd Green Bank Telescope can cover 80 per-cent of the sky, while other large radio telescopes cannot cover half that amount of sky. Astronomers also point-out that new research into gravitational waves and pulsars has invalidated the conclusions of the 2012 study. The Robert C. Byrd Green Bank Telescope is well-known for pulsar research and can make progress in the research now, without the need to wait for new facilities to come on-line. The NRAO has started to find academic and private partners to help with the funding of the Robert C. Byrd Green Bank Telescope. These include West Virginia University, the North American NanoHertz Observatory for Gravitational Waves (NANOGrav), and the Breakthrough Listen project. However, these partners may not be able to fully compensate for a complete loss of NSF funding. In addition to astronomical research, the NRAO inspires in the general public, particularly students, an interest in Astronomy and Science. More than 2,500 people tour the facility, or participate in mentorship or Summer internship programs, each year. 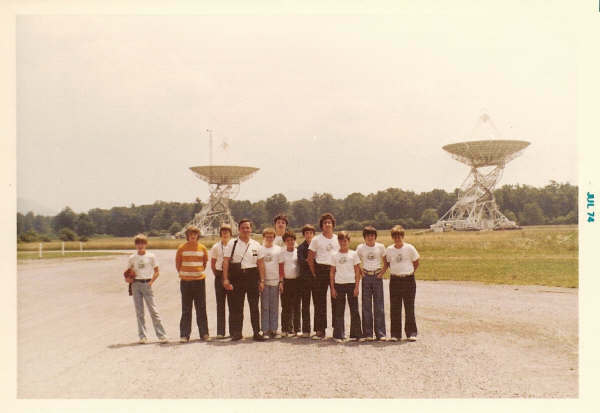 For instance, groups of radio students from a Summer camp near White Sulphur Springs, West Virginia, Camp Shaw-Mi-Del-Eca, toured the facility in the 1960s and 1970s. Workshops and research training for West Virginia teachers are also provided. The NRAO is also a major teaching and research tool of West Virginia University (WVU). Since 2006, WVU has produced 56 academic publications related to the Robert C. Byrd Green Bank Telescope, with 19 of them published just this-past year! Hannah, Elaine. "Green Bank Telescope Captures An Image Of A Stunning Star-Forming Gas In Orion Nebula." ScienceWorldReport.com 2017 June 19. Steelhammer, Rick. "'Green Bank Telescope produces image of star-forming Orion gas filament." Charleston Gazette-Mail 2017 June 17. Vosteen, Paul, Green Bank Observatory. "Orion blazing bright in radio light." "Space Race Rumpus supports Northern Pocahontas Wellness." The Pocahontas Times, Marlinton WV 2017 June 14. Event hosted by Green Bank Observatory. Holdren, Wendy. "Jenkins discusses funding for mine reclamation sites, Green Bank Observatory." The Register-Herald, Beckley WV 2017 June 9. "Video: Rep. Evan Jenkins on the future of Green Bank." Video. The Herald-Dispatch, Huntington WV 2017 June 8. "Future of Green Bank Observatory." Williamson (WV) Daily News 2017 June 8. Steelhammer, Rick. "'National security community' eyes possible deal with Green Bank." Charleston Gazette-Mail 2017 June 7. "Video: Rep. Jenkins On The Future of Green Bank Observatory." News Release. Waugh, Rob. "There's a town in America where there is no Wi-Fi - and no smartphones." Yahoo News UK 2017 March 30. Bakalets, Lesya and Sergey Sokolov. "For West Virginia, No Wi-Fi, No Problem." Text and Video Report. Voice of America 2017 March 29. "New NASA Radar Technique Finds Lost Lunar Spacecraft." Jet Propulsion Laboratory / NASA 2017 March 9. To find a spacecraft 237,000 miles (380,000 kilometers) away, JPL's team used NASA's 70-meter (230-foot) antenna at NASA's Goldstone Deep Space Communications Complex in California to send out a powerful beam of microwaves directed toward the moon. Then the radar echoes bounced back from lunar orbit were received by the 100-meter (330-foot) Green Bank Telescope in West Virginia. Benningfield, Damond. "Loud Sun." Blog-Post. StarDate Radio Program 2017 Feb. 27. He concluded that the noise came from the Sun itself — the first confirmed detection of solar radio waves. Rohan. "A Trip to Green Bank." Blog-Post. Buckeyes Blog: Undergrad.osu.edu 2017 Feb. 21. Gardner, Jennifer. "Professor Q&A: Duncan Lorimer, Department of Physics and Astronomy." Daily Athenaeum, West Virginia University, Morgantown 2017 Jan. 18. Regarding research using the Green Bank Telescope. O'Neil, Karen and Michael J. Holstine. "Letter: Green Bank Observatory thanks West Virginians for support." Letter-to-the-Editor. Charleston Gazette-Mail 2017 Jan. 17. "World’s Largest Fully Steerable Radio Telescope Risks Shut-Down." 2013 Sept. 5. "Petition: Save NSF Funding of Green Bank Telescope." 2012 Nov. 20. NRAO facilities are now the Karl Jansky Very Large Array (VLA) in New Mexico and the jointly operated Aticama Millimeter/submillimeter Large Array (ALMA) in Chile, run by NRAO, ESO and NAOJ. Using Car Rental 8 you can find the cheapest car hire from over 50000 international locations.